In real time—September 1, 2017—I just woke up in my own home for the first time in three months after living, traveling, and working abroad. It’s disorienting. My place feels the same, yet different. Maybe that’s because I sold it right before I left, and as soon as I unpack my suitcase I will need to start packing everything to move in one month. This will be my third move in two years. This one will be hard. I love this place—its location on The Hill near all the mansions and shops and restaurants, and the character of the condo itself—with beveled glass, graceful curved woodwork, exposed brick walls, fireplace, high ceilings, and warm wood floors. When I woke up at midnight last night to the creaking and thumping of my upstairs neighbor walking around on his wood floors, I smiled and knew I had made the right decision. I’ll be moving into a duplex on St. Paul’s east side. You know what they say about rents and real estate: “Location, location, location.” And it’s true. The duplex is very nice but there’s nothing much nearby except other duplexes. Therefore it’s cheap. I’ve signed a 10-month lease and I can lay low there until I decide what to do next. I am lucky to have the choices I do. 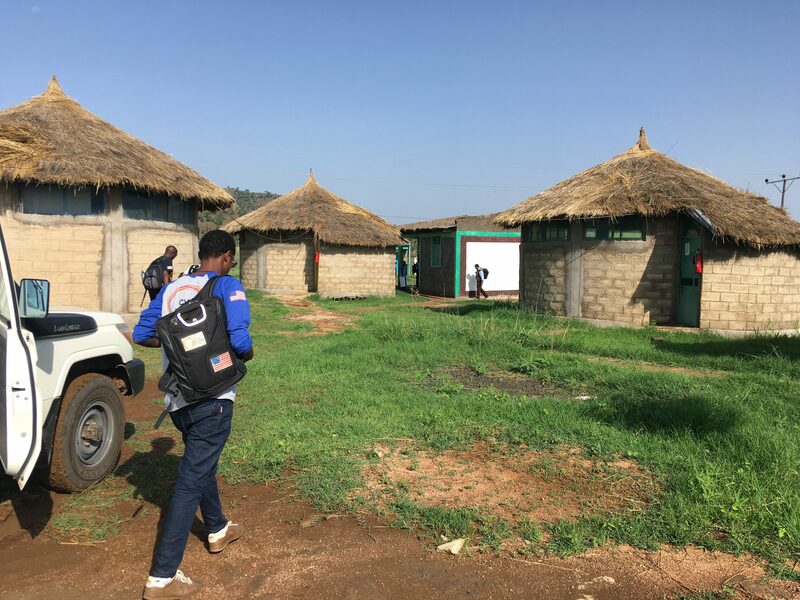 I knew that intellectually, but spending time in refugee camps made it visceral. 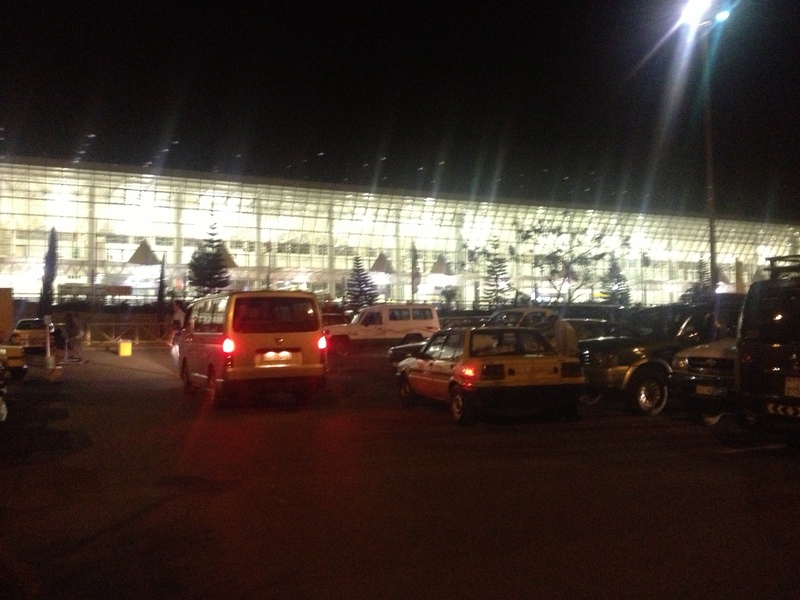 I arrived at Heathrow from Addis Ababa at 7am. I had barely slept due to my cold and, well, having to sit upright in a cramped airplane seat. There was Lynn waiting for me in the arrivals hall—the one where they filmed the opening scene in Love Actually. If you haven’t seen it, it’s a sweet montage of people meeting people at the airport. Friends, families, business associates … smiling, waving, hugging, laughing, and then walking off to start whatever lay ahead for them in London or beyond. I transferred myself from Maki’s good guidance to Lynn’s. I am a “take charge” person but Lynn is even more so, and we were on her stomping grounds now. First stop, Boots, the chemist, which is like a prettier version of Walgreens. I loaded up on sore throat spray, cough drops, and tissues. We got a cup of coffee at Costa and found the car rental kiosk. Lynn bought all the insurance they offered, which would turn out to be a good thing. This was supposed to be the vacation part of my sojourn—two weeks of driving around the southwest of Britain, starting in Cornwall. Until recently, I’ve never had a problem logging off of work email and not checking it while I’m on leave. 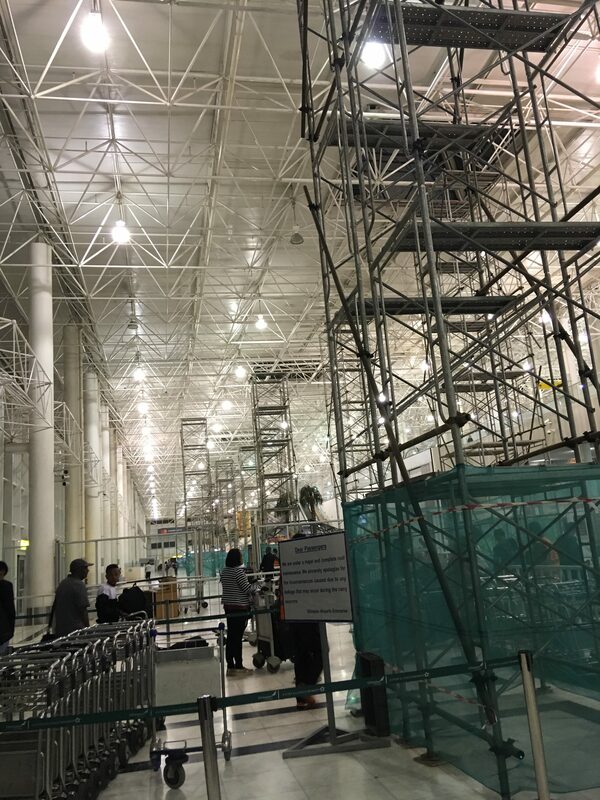 I crossed a line somewhere and started doing that, and when I did, at Heathrow while Lynn was making the car arrangements, there was an email about an opportunity for us to submit a concept note to DFID, the UK’s Department for International Development. It was due in less than 10 days. A concept note is like a preliminary sales pitch to a potential funder. You send them 3-5 pages summarizing your big idea and hope they ask for more, in the form of a full grant proposal. Thing is, you have to put almost as much work into a concept note as a full proposal because you have to give them a top line budget number, and to get that requires, basically, developing the full project and budget. I was really glad we were going for this, and I wanted to work on it. I had met with a DFID representative two years before when I was in Amman, Jordan. We had tried to stay loosely in touch with him, and if we are funded, it would be almost a textbook example of how development/fund raising works. But the timing that was inconvenient. Lynn doesn’t need anyone to entertain her, but I thought it would be rude to be constantly checking my email and on Skype while she was having a G&T by herself on the patio at the resort in Cornwall. Being online too much would turn out to not be a problem. 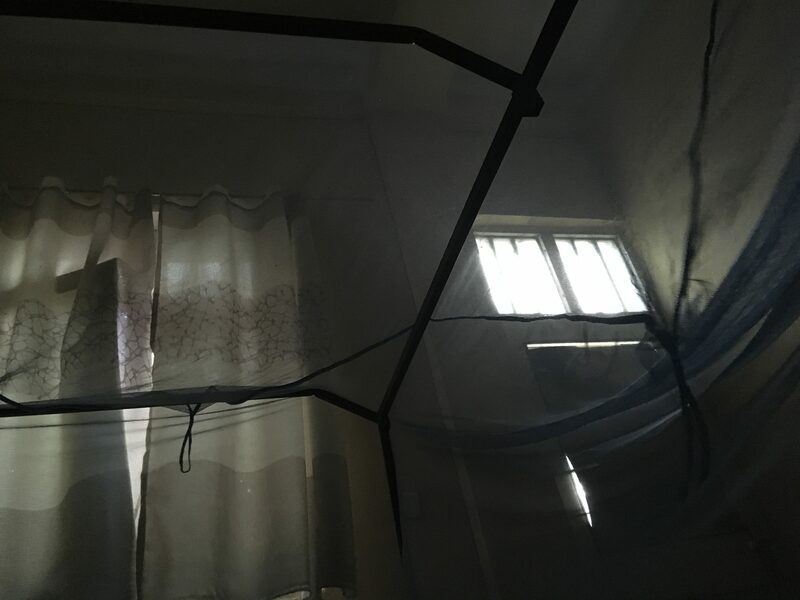 This entry was posted in Adventure, Budget travel, Culture shock, International Development, Living abroad, Travel and tagged England, Ethiopia, travel, UK, Workalholism on September 1, 2017 by Breaking Free. My penultimate day in Ethiopia. There, I’ve always wanted to use that word. Today I would be observing a training and a women’s group. But first, I settled up my canteen bill, handed in the Chinese dongle that had never helped me get an Internet connection, and returned the ancient Nokia I had been given the first day. For once, my age was an advantage with technology, since I had learned to text using the ABC system way back in 2005. Pity the millennial or younger generation who has only known smart phone qwerty keypads with autocorrect. I could receive messages but the phone wouldn’t send them. I could see a queue of failed sends attempted by previous users. 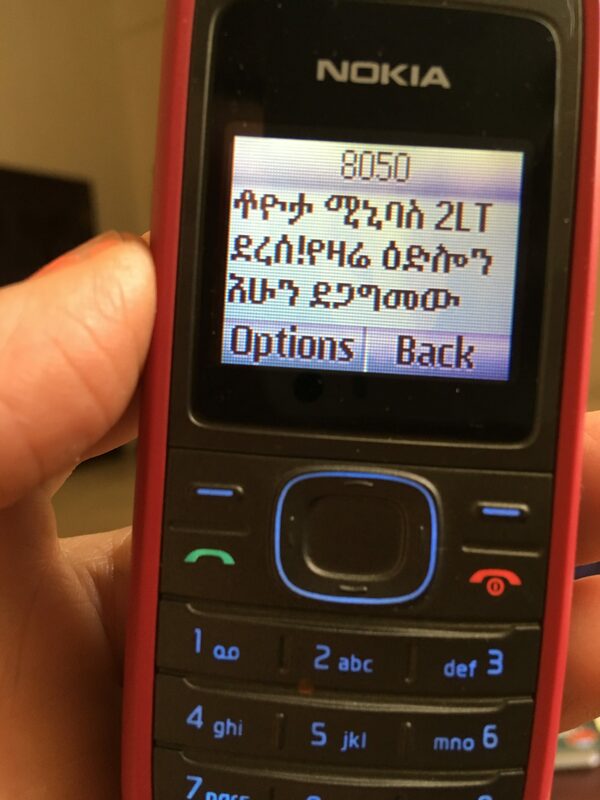 I also received various messages in Tigrinya. I will never know if the message below was important. Had I missed an incredible two-for-one offer on camel milk? Maki sent me several messages and I responded to her via my iphone. Then she would reply to the Nokia. It was a little confusing. I did some packing and noticed that my mattress was covered with this fabric. I stared at it. 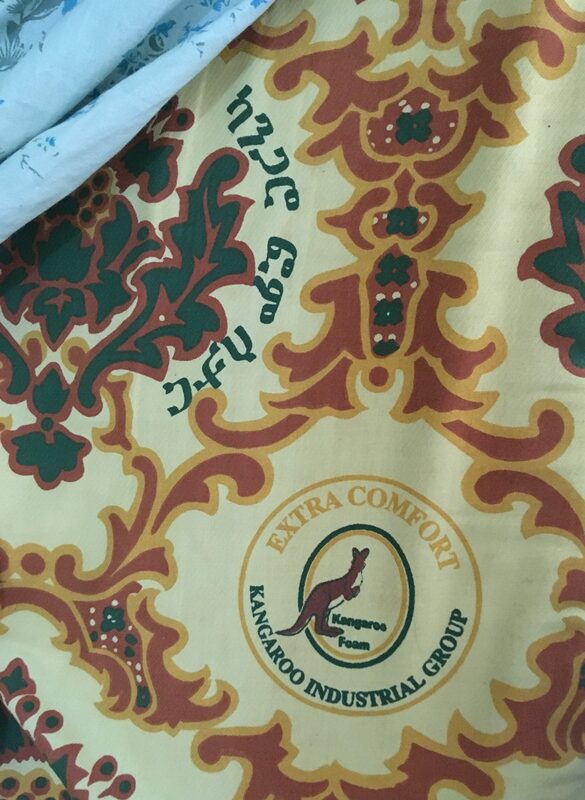 Why were there kangaroos all over my mattress and why had I not noticed before? I had been here a week. I can only posit that it was an example of how the mind narrows down when it is overwhelmed with too much new stimulus. It could also be related to what I call “the gauze effect.” I have often gone on a trip to a developing country thinking I’ll write blog posts every day, or fill my hours drafting a novel, or learn French because I’ll have lots of time on my hands. I do none of that. In fact I do nothing much, because the pace of life is so slow, the heat so intense, and getting the smallest task done feels like a major miracle. It feels like a soft cotton gauze has settled over your head. You can’t think, you can’t act. Making a photocopy feels like a big accomplishment worthy of being rewarded with a nap. 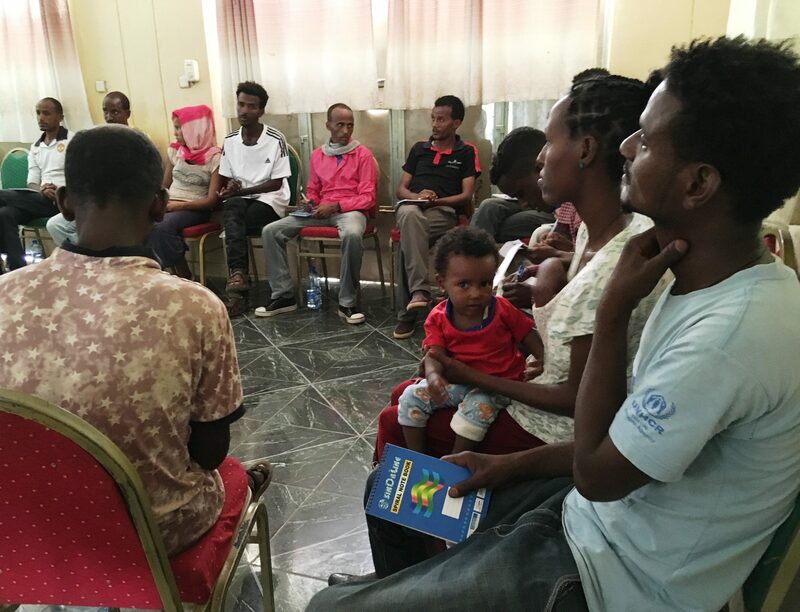 I attended a two-hour training on attachment in the morning that was given by our expert psychotherapist to employees of other NGOs working with Eritrean refugees. Several young women had brought their very cute babies, and I thought it must be a nice bonus for them that they got paid to learn about child development and attachment on the job. 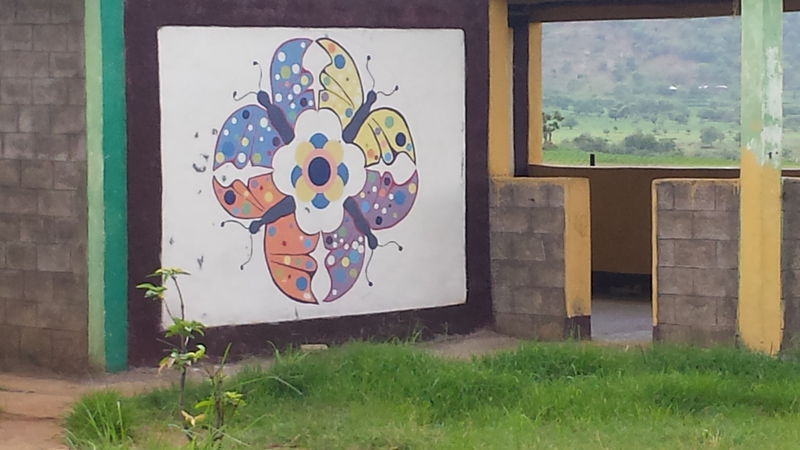 A rooster had flown over the wall of our compound and was crowing incessantly in an alcove outside the training room. 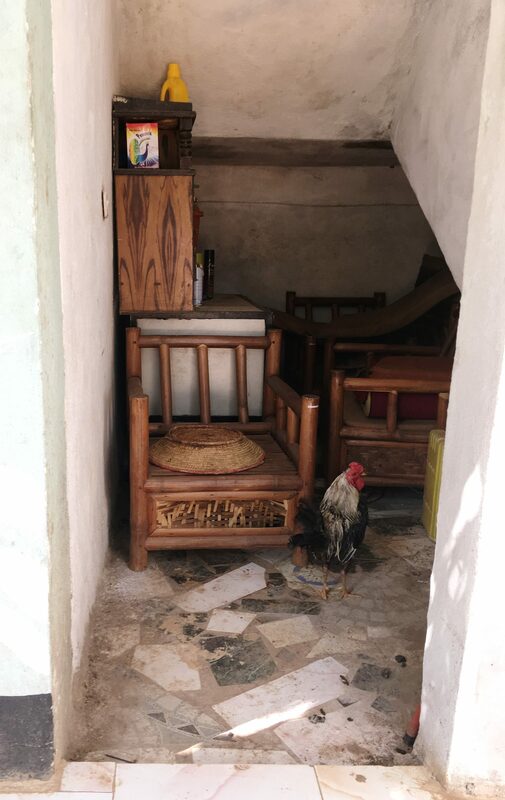 Suddenly I saw one of the cooks stride purposefully past the door and the rooster gave an alarming “Bwuauck!” We would be having poultry for dinner tonight. After lunch we rode to one of the camps and hung around waiting for clients to show up. One by one, women arrived, some with children. CVT has a childcare tukul but the babies stay in the groups with their mothers. About 15 minutes past the hour there were 10 women assembled and the facilitator began. Thankfully she didn’t ask me to speak, she just told them who I was and I gave the same introduction as the rest of them: name, age, marital status, number of children, and how long I had been in Ethiopia. “One week,” I said, smiling. And I thought, pained, And I get to leave tomorrow, while none of you knows when she’ll return home or be resettled, if ever. The facilitator translated here and there but mainly it was similar to the boys’ group the previous day; I knew enough to get the gist of what was going on. All of the women were married with children and dressed in traditional clothing except one. She was dressed in jeans and a tight-fitting T-shirt and had her hair in a glamorous up-do. At first she sat slouched down in her chair with her arms crossed as if to say, “I’m not one of you.” But as the group went on and the women shared she sat up and leaned forward. It was a remarkable transformation, and a great example of the power of group counseling. This entry was posted in Adventure, Budget travel, class divide, Culture shock, Empathy, International Development, Living abroad, Torture, Travel and tagged Eritrea, Ethiopia, Refugees, travel on August 22, 2017 by Breaking Free. I had been asked to say a few words of greeting from Center for Victims of Torture headquarters to a counseling group of 12-14-year-old Eritrean refugee boys. This was daunting, not only because I had laryngitis but because, well, what could I say that could possibly be of interest to them? I stood up and rasped out a few words about how we in Minnesota do our best to tell their stories to the world, and thanked for allowing me to sit in on their group because it would help me raise more funding so we can work with more refugees. I hoped that last part would actually be true. The boys watched me with curiosity as I spoke, probably wondering why I sounded like a chain-smoking man. 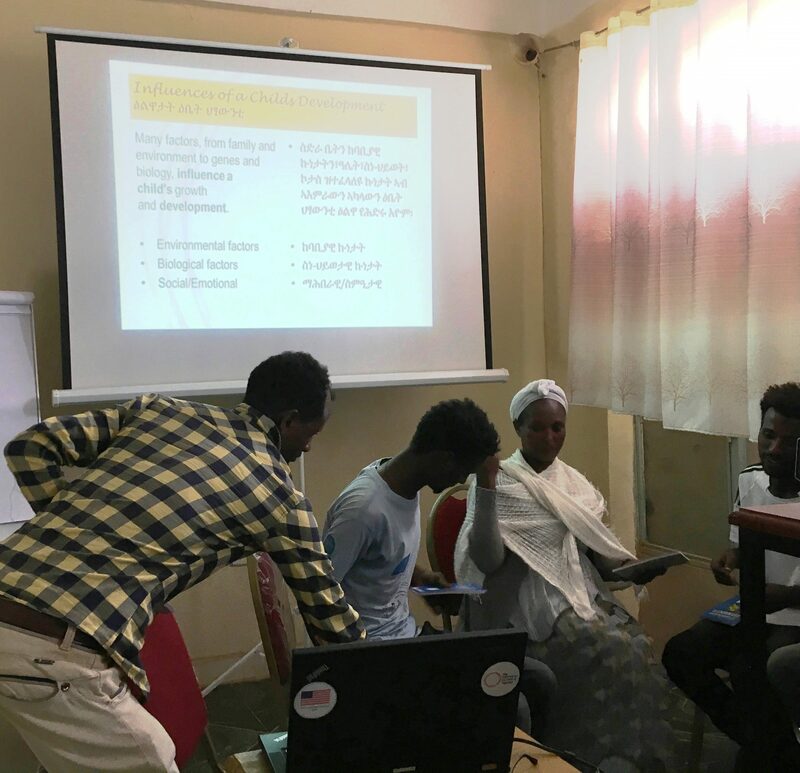 My words were translated into Tigrinya, then they nodded and smiled at me and turned their attention to the young counselor who would facilitate the group. I had expected them to maybe feel self-conscious with me there, but I think they forgot all about me. I love kids of all ages. Each age has its adorable and unpleasant aspects, but I couldn’t find anything unpleasant about these kids. Like boys this age anywhere, they were awkward and gangly. Some were tall for their age and had deep voices while others were puny and squeaky voiced. Some had peach fuzz on their upper lips. 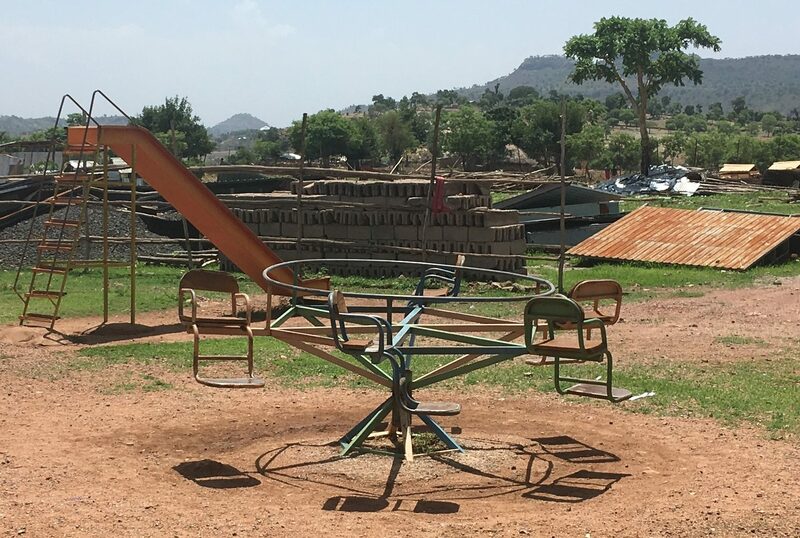 They slouched, hunched over, spread their legs wide, and tipped their chairs back until I wanted to lunge forward and say, “Don’t do that—you’ll fall over!” I thought how difficult it must be go through puberty in their situation. Many if not all of these boys were on their own, without any family members. They lived in groups with an adult caregiver in very small houses with no privacy. When my son was 12, if anyone asked him how he was feeling he would have rolled his eyes, made a joke, and changed the subject. These boys showed no reluctance to talk about feelings and how to manage them. In fact, they took the group very seriously. 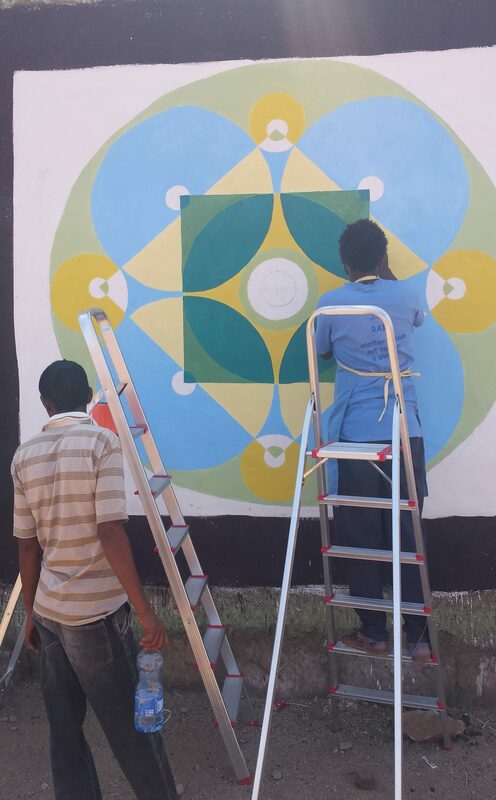 As I wrote in a previous post, this was the third of three groups designed as a kind of “coping bootcamp” for young Eritreans who were at risk of suicide or of leaving the camps in a futile search for a better life. None of what was said was translated, but it didn’t have to be. There were visual aids (complete with misspellings) and I was pretty familiar with the concepts being taught by now. For instance: it’s normal to feel angry or hopeless considering what they’ve been through; feelings come and go, like clouds, so usually if you wait they will change; emotions can be managed by talking, exercise, meditation, etc. The facilitator had already taught these concepts in the first two meetings and was drilling the boys about them. They were totally engaged, almost all raised their hands enthusiastically to answer, spoke gravely, and discussed points of clarity with each other seriously and respectfully. I may have imagined it or may be exaggerating, but it seemed to me as if they treated the information as if it was a matter of life and death. 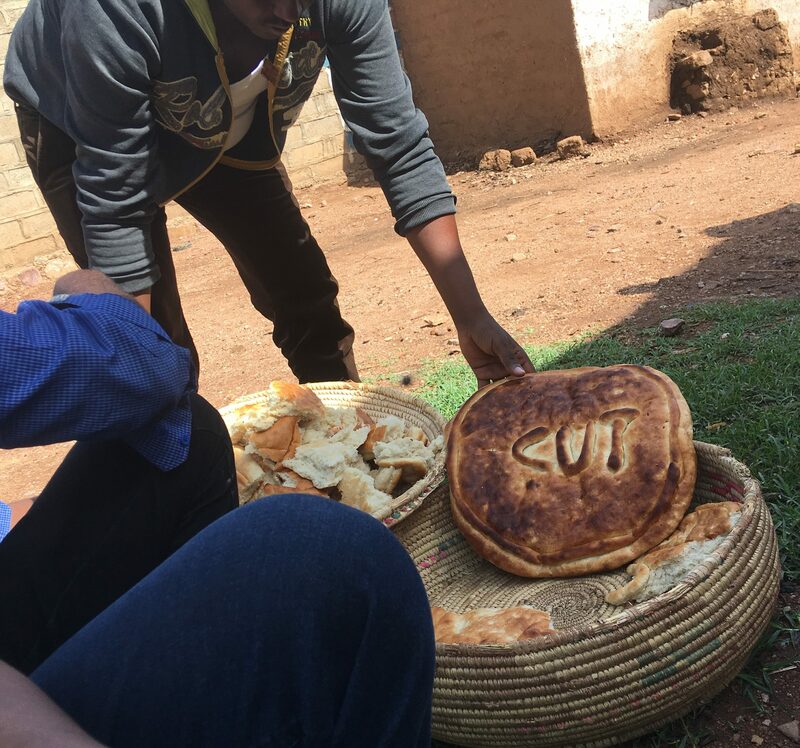 I was a bit relieved when the group ended and the boys spilled outside to share some ambasha, a traditional bread. You could say that branding is literally baked into everything CVT does. 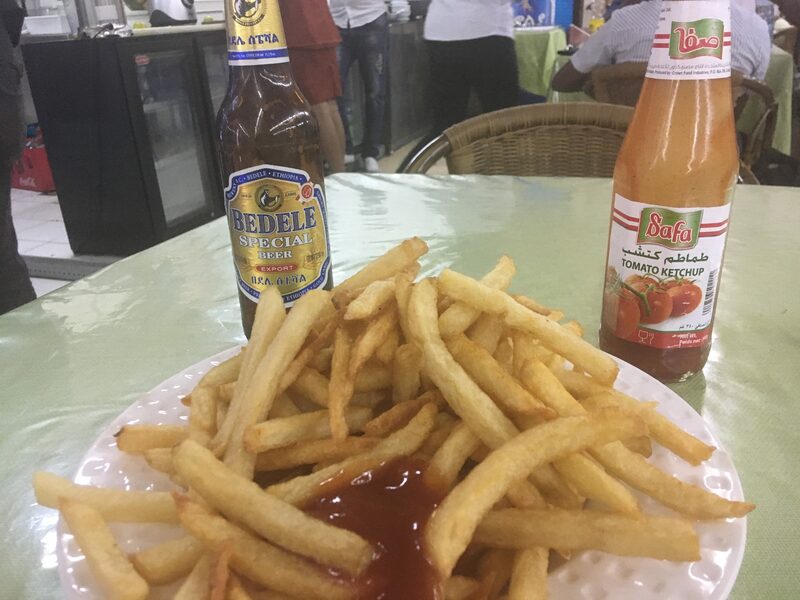 People have asked me how the food was in Ethiopia. It was really good. CVT has a staff canteen where two cooks serve breakfast, lunch and dinner. I paid about $11 for an entire week of meals. There was just enough—no seconds, no gorging—you wouldn’t gain weight if you lived there for a long time. 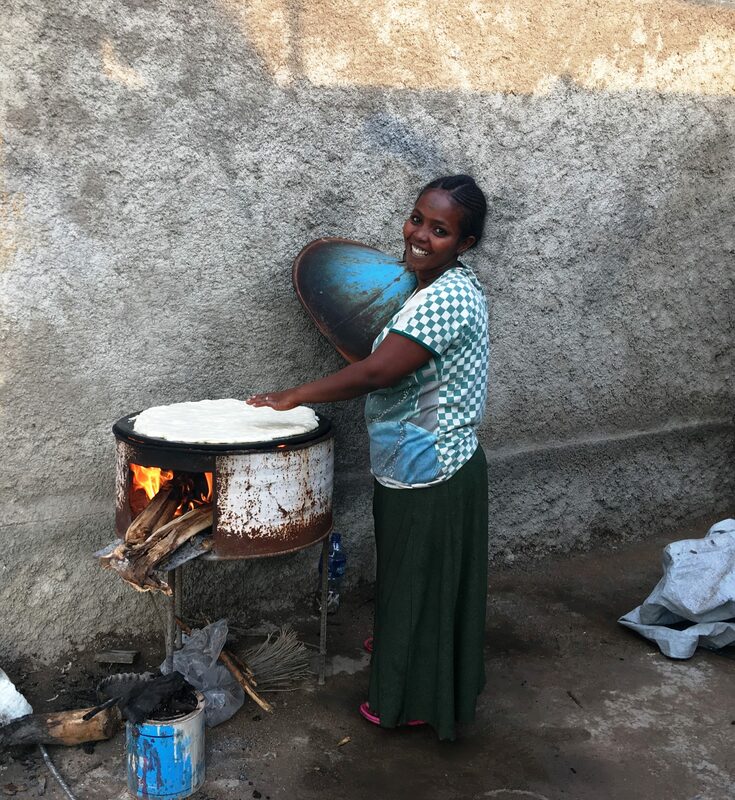 Here is one of the cooks, heavily pregnant, baking ambasha over an open fire on the roof because the power was out (I always asked my coworkers if it was okay for me to take and use their photos). She had used plastic bags to get the fire started, over my protests. Note the can of paint nearby, probably highly flammable. 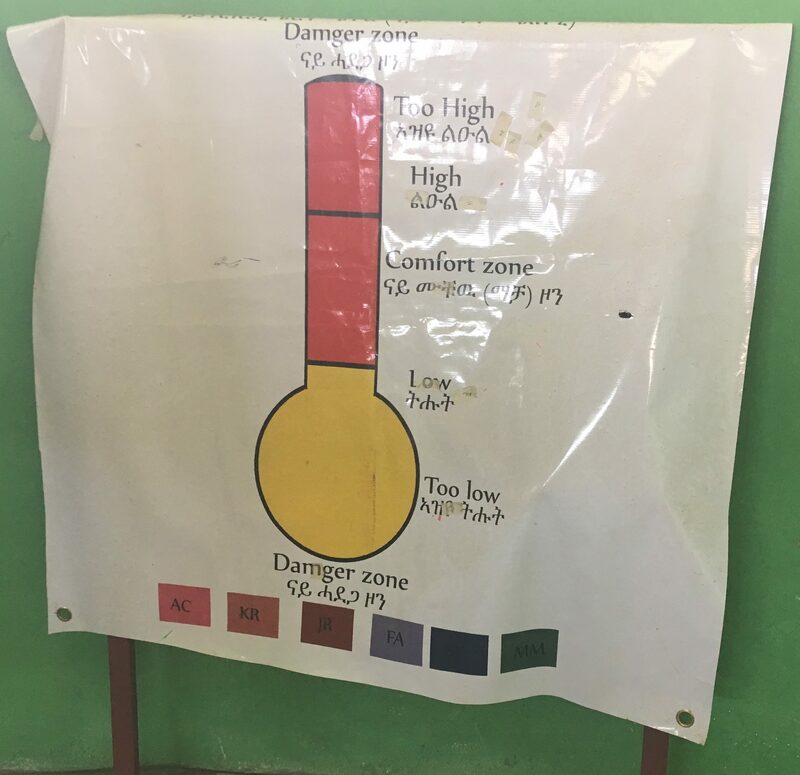 Employee health and safety have a long way to go in Ethiopia. 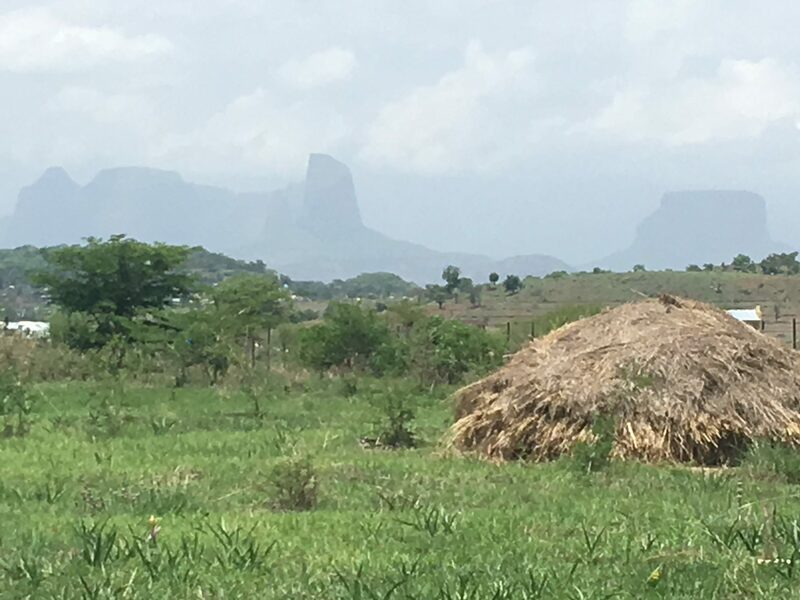 This entry was posted in Adventure, Budget travel, Culture shock, International Development, Living abroad, mental illness, suicide, Torture, Travel and tagged Eritrea, Ethiopia, Refugees, travel on August 19, 2017 by Breaking Free. I spent two days in the refugee camps. On the first day I got a walking tour of the camp from the young colleague who had shown such great interest in tiramisu. He walked at a brisk pace and I managed to keep up despite the ground being muddy and strewn with large rocks and pocked with water-filled potholes. My colleague asked me if I wanted a cup of coffee and I responded enthusiastically. People had set up small businesses along the main road; some sold beer, some packets of crisps and nuts or single application shampoo packets. There was a cigarette vendor who sold one cigarette at a time, since no one could afford a whole pack. We stepped into a thatched hut that served coffee. 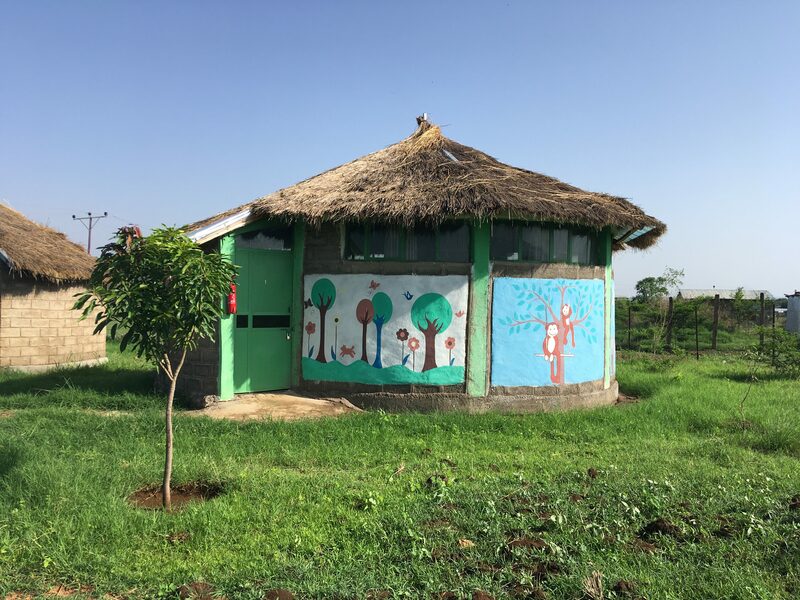 I was the only woman and I got a few looks—not hostile or lewd—they just seemed to be noting, “Huh, a woman in the coffee hut.” Knowing how hard women here worked, I wondered if there was a separate women’s coffee hut somewhere or if they managed without coffee. Just the thought makes me tired. We sat on the ubiquitous white plastic chairs, drank bittersweet coffee, and chewed on some kind of beans or nuts. My colleague’s English was difficult to understand, so as I chewed I wondered if I would soon be seeing flying unicorns. He talked about being an artist and a project he was working on. I could croak out a few syllables now, but I didn’t want to be mute while traveling back to Europe in a few days so I mostly just nodded and smiled. We returned to the CVT area. There, we have built tukuls that serve as cool, calm oases in which people attend counseling groups. 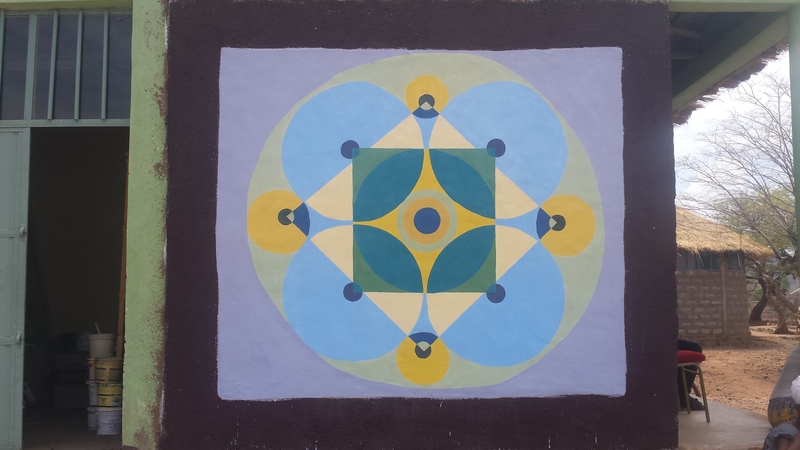 We’ve got an art therapist from Chicago who is leading the painting of tukuls for children and creating mandalas on others. We arrived at break time, so there was more coffee and popcorn with the whole staff of about 10 people. They insisted I sit on the one (white plastic) chair while they stood or squatted on the ground. I had been warned about this by others from headquarters who visited—that our staff will insist on visitors taking the chair and that it would be embarrassing. I had just had an hour-long hike around the camp under a blazing sun. I was twice as old as all of them. Age is revered in some cultures and if my age or perceived status as a visitor got me the chair, I wasn’t going to say no. After the break I was taken to a tukul where a group of 12-14 year old boys was assembled for a counseling session. CVT’s standard counseling groups run for 10-weeks. However, if you’ve ever had a teenaged boy in your life you know how restless they can be. These Eritrean teenagers had picked up and walked out of their country. They did not enjoy hanging around a refugee camp with no prospects. As I’ve written briefly about before, many of them walk off again, toward the Sinai Desert in hopes of reaching Israel, or farther on toward Libya and the Mediterranean Sea with hopes of reaching Europe. Some do make it, but most are kidnapped in the Sinai by Bedouin or other traffickers, or drown in the Med. Ten-week groups are just too long—many of the boys won’t be around by the third week. So CVT developed a three-meeting group model, and I was sitting in on the third one. Everyone had a chair. But first, they made me stand up and give a speech, since I was such an important person from headquarters. Now this was a little uncomfortable. Little did they know that I am nobody special, but I rasped out a few words anyway. 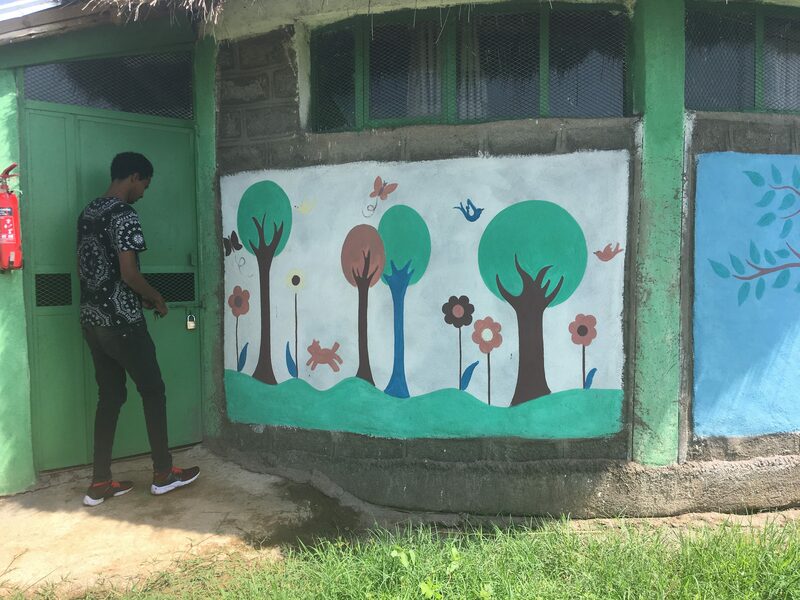 This entry was posted in Adventure, Budget travel, Culture shock, International Development, Living abroad, Travel and tagged Eritrea, Ethiopia, Refugees, travel on August 17, 2017 by Breaking Free.